NEW YORK (TheStreet) -- With markets showing they need some time, I took last weekend off to go away and get in some skiing. My apologies to the many who've emailed wondering about my thoughts this past week on gold (GLD - Get Report) and silver (SLV - Get Report). Markets remain choppy here, with leading stocks needing time to set up better bases and charts, so cash remains a good position while we wait for the easy money to return. Gold tried to breakout but failed and could be looking for some more downside now. I've said all year and beyond that the slower gold moves up, the better. We are building lots of support levels as we slowly move off lows, so I still think we have years to go before we see the blow-off acceleration that so many are craving. While we wait for gold to have its blow-off top, there are going to be many other areas to find such action -- the most recent being fuel cells. That was a very profitable and fun trade for us. Let's take a look at the precious metals charts and see where we can expect to find support. Gold fell 3.47% this past week after failing its breakout. We saw a classic reversal after the breakout, and now gold is looking for more downside. The bad news is that the weekly chart also shows the same bearish reversal bars that could easily see us retrace back to the $1,200 area. But let's focus on the daily chart. Support is at $1,300, where the 50- and 200-day moving averages sit for now. 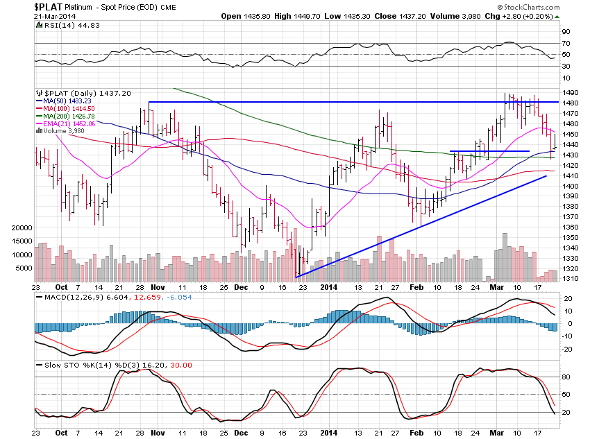 More significant chart support sits at $1,280. We have more downside to go here, from what I see. But there could be a move back near $1,360 before more downside sets in. Basically, I'd avoid trying to trade gold here and wait until we see a much easier and safer setup. Silver lost 5.45% this past week and, so far, is moving back into its long flat base between $19 and $20.50. If we remain in this base, there is a good chance we will test $19 again. 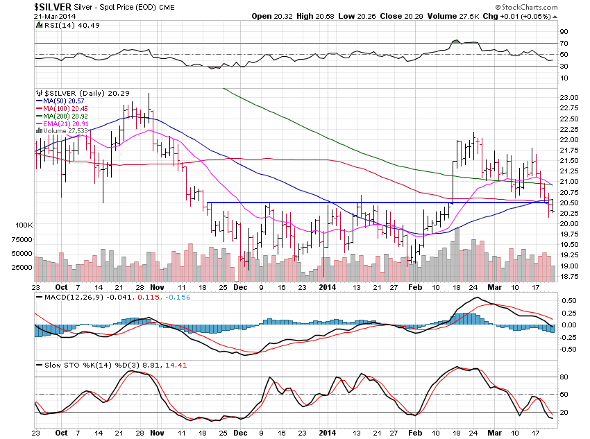 The good news is that if we close above $20.50 on Monday, it will be a powerful buy signal. But I'm not so sure we will see that come. I'm in wait-and-see mode with so many things. I try not to guess at trades. Rather, I wait for a setup I've seen before and one that's worked well for me in the past. Right now, we are in a no-man's-land, and I tend to take more time away from the office and enjoy life a bit more when the markets allow me to, as they are doing right now. If only all this snow would soon melt! Platinum (PPLT - Get Report) slid 2.30% for the week just ended. 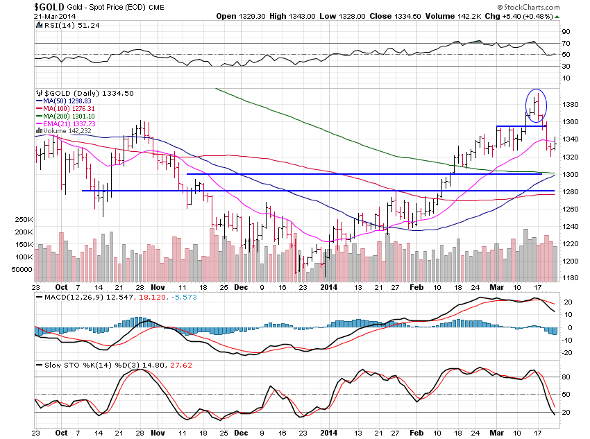 The $1,480 to $1,490 area is a strong resistance level for now. But the good news is that once we get above, that area will be strong support. For now, we are holding moving average support. But it looks to me as if we need to move back near $1,410 and see how that area reacts. $1,390 will be next if we can't hold $1,410. The last letter I wrote was titled "Pretty Palladium," and it sure turned out to be true. 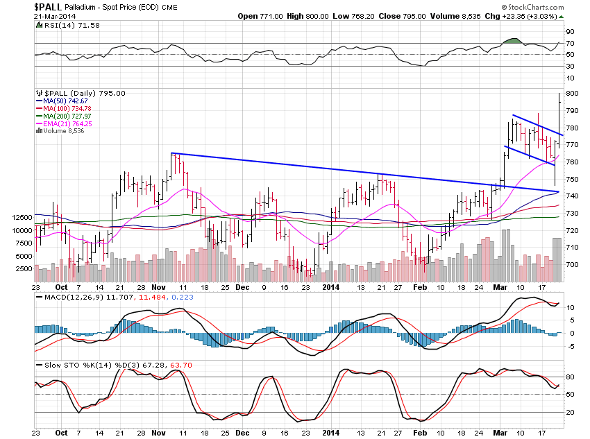 Palladium (PAL ended the week up 2.78% and is breaking its nice bull flag. As is so typical with the precious metals, the stock movement tried to shake out everyone quickly as it had a large down day to test the breakout level. But the closing price Thursday was very strong and on heavy volume. This is a confirmation of the original buy signal. There's superb action here in palladium, and it's a chart to study. It had a great breakout on the weekly chart, and if you can find another chart that looks similar, chances are it will behave just like this one. Enjoy the rest that the market is giving us while it lasts, because we will be busy as bees again soon enough.